Spec Fry Pan Robust Plus26cm -Made of stainless steel , chrome good amount more than 8.5 % , it also features an excellent resistance to corrosion . -Technology sheet heat dissipation base pot (Capsule Base) to optimize heat dissipation so quickly and thoroughly cooked food was nutritious and colorful uniform. 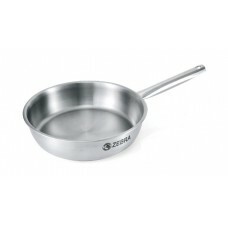 -Available with induction hob and oven all types. -The handle is made of stainless steel is durable for applications such as professional kitchens, hotels, restaurants, restaurants and catering services sector . -Designed to accommodate modern kitchen The shape is modern and unique design .